Together We Can Help Stop Chimney Fires | Inspect A Home, Ltd.
“Tis The Season” for family and friends to gather around a roaring fireplace but here’s some information you should have before you start that fire. 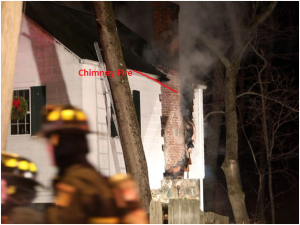 A local chimney fire which made the news inspired me to write this newsletter. So… I’d like to share some information with you in the hopes of raising awareness regarding fireplaces, chimney flues and fires that can be directly related to chimney construction and maintenance deficiencies. One of my family members is a journalist and over the years has covered and read about many chimney fires. I want you to know that these fires take place more often then we thought possible throughout the United States, myself included ! About a year ago a local older house built between the mid to late 1800’s had a chimney fire but this particular house had several fireplaces which appeared updated. By this I mean, the chimney was constructed of brick rather than the stone material used to construct the foundation. Since the foundation was stone one would think the chimney would be constructed of stone as well and by first glance we would all presume its newer and in acceptable condition, right? Well… not in this case! This particular house is older and as I understand it had a thorough review of the fireplaces and its components prior to this fire. Let me point out a few facts that can facilitate chimney fires and by no means is it all inclusive, but my objective here is to raise awareness. For example: if you see efflorescence, a white chalky or yellowish hue colored salt deposit, at the exterior of the chimney chase, whether it be in the attic or outside, may indicate deteriorated mortar joints or flues. If no flues exist then the chances are greater for exhaust by-products and heat from a boiler, furnace or fireplace to penetrate openings in the mortar joints and enter the dwelling. This situation creates a dangerous circumstance that can allow exhaust by-products into the home and transfer heat to adjacent framing members and if build up creosote ignites, well this will only add fuel to the fire ..so to speak. If you do see a yellowish salty type substance this may also mean that sulfur deposits from an oil burner may have mixed with condensation to create sulfuric acid. This in itself may begin to deteriorate mortar joints over time. Mortar deterioration can result from many variations or sources such as, but not limited to, poor workmanship and materials. -If the flues are not connected and stacked properly it can allow moisture to enter the chimney components, deteriorate mortar and associated joints. Over time heat combined with fuel by-products can escape via the flue liner joints and or components. -Condensation from the absence or improperly installed concrete chimney caps may allow water to enter between the liner and brick and in some cases break down the single wythe of brick between two flues. This will allow for deterioration of brick and chimney components designed to control the exhaust gases and heat. -Improperly sized flues can create condensation and then mix with sulfur deposits created from oil burner exhaust gases or by-products which can create sulfuric acid. Sulfuric acid can develop from any of the circumstances noted above as long as moisture is one of the components. Although this is not common and flue sizes are generally sized properly to reduce condensation build-up, it can happen and these circumstances can deteriorate mortar joints and chimney components. by-products into the house when mortar joints begin to break down over time. If it is determined a chimney does not have a flue liner then one should be installed. 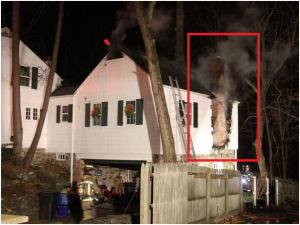 Fortunately no one was harmed from this chimney fire! !….and the house and chimney were repaired. As I understand it, this chimney, flue and fireplace was inspected by a chimney sweep type contractor and said to be in acceptable condition, but the attached picture(s) tells us differently. We all know a common sense approach is always practical, however, maybe its becoming more and more necessary to review chimneys in more detail, especially in older structures. Maybe using cameras or any other means necessary to fully check for breaches, poor workmanship etc. is the way to go…. 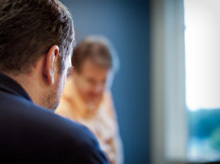 This may not always be the answer, however, maybe it’s the only way to truly step up a chimney review by inspecting as many components as possible in more detail. Keeping the chimney clean especially when we see 1/8″ or greater layer of creosote, a tar like substance, is important. If your house has an ash drop please be sure there is a properly operating fire rated door at the clean out area. I personally prefer embers to burn out in my fireplace chamber and remove them when all ashes are cold. I feel this will always facilitate fire safety and reduce the chances of a related fire. Well, these are a few of my thoughts on the subject and I hope this newsletter raises some awareness the next time you look at a chimney. If you have any building or building component questions you would like me to expand on please let me know and I will try to answer your question with as much detail as I can….. Or if you have something that you would like to share with us, we would love to read it.